Back home we have three different sizes of souffle dishes, but none here. And, to further complicate matters, our electric oven is not very tall, so anything rising to full deliciousness might burn on the upper heating element (don’t ask me how I became aware of this problem… ;-)). 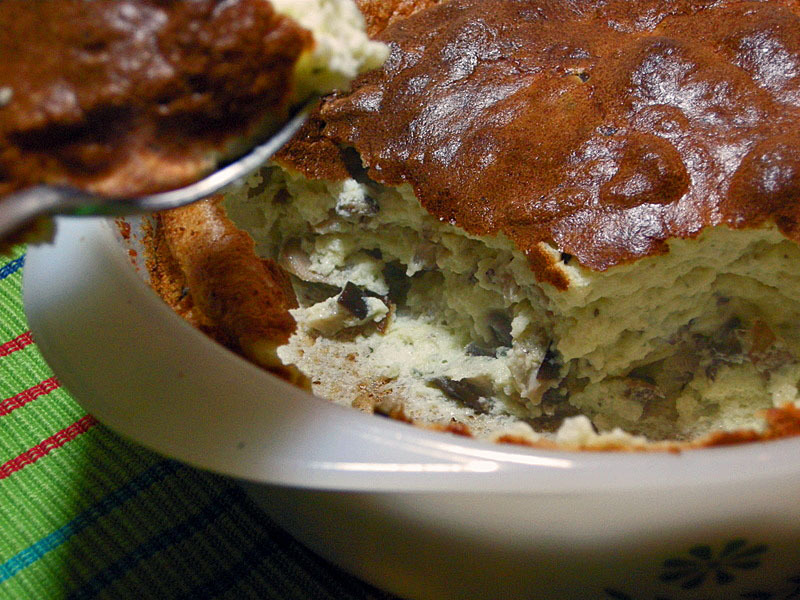 Still, once the idea of a mushroom souffle got in our heads, it was impossible to resist. Starting with Julia Child‘s basic master recipe, I down-sized it for a small baking dish, gathered the ingredients and went to work, with fingers crossed for a great New Year’s Eve meal! Prepare your baking dish (8 inch diameter, 3 inches tall; about 6 cups volume) by coating it with butter and sprinkling bread crumbs inside, tapping out the excess. Break the eggs and separate yolks and whites – allow the whites to sit at room temperature while you prepare the souffle base. Heat the olive oil in a skillet, add the shallots, cook until translucent and starting to get golden. Add the mushrooms, season with salt and pepper, and cook stirring a few times, until they release all their liquid and it completely evaporates. It is important to have the mushrooms without excessive moisture. Transfer to a plate to cool slightly, trying to spread them out as much as possible to release steam. Prepare the bechamel sauce by melting the butter in a saucepan, adding the flour and cooking for a few minutes, stirring constantly. Add the warm milk all at once, season with salt, pepper, and nutmeg, and cook until it thickens (about 5 minutes on low heat). Remove from the heat, let it cool slightly, then add the egg yolks, one at a time. Reserve. 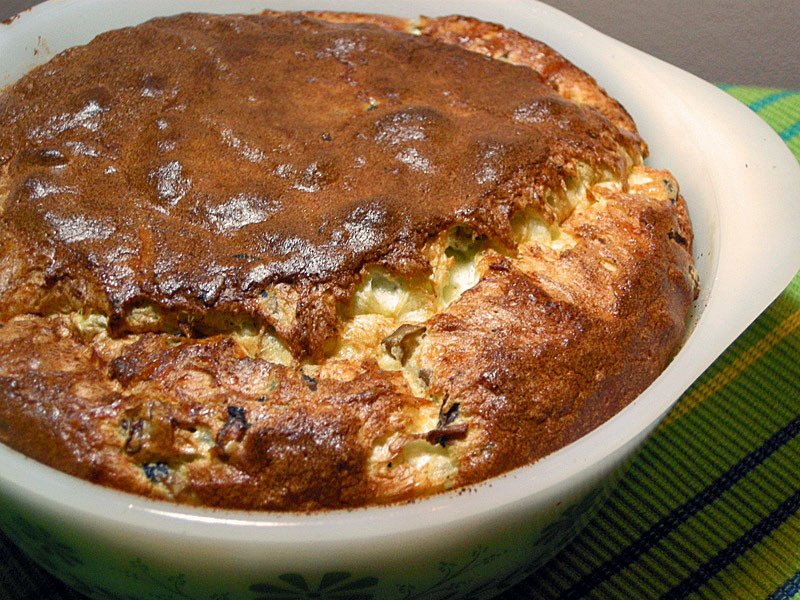 When it’s time to bake the souffle, add the sauteed mushrooms to the bechamel sauce, mix well. Add the grated cheese, a little at a time, mixing to incorporate (you may not need to use it all, don’t make the batter too heavy). Beat the egg whites with a pinch of salt in a very clean bowl using an electric mixer until they form soft peaks. Add 1/4 of the egg white mixture to the mushroom/cheese base, and mix well. Now, working gently, incorporate the rest of the beaten egg whites, carefully folding it, trying not to loose too much volume. Pour the batter into the prepared dish and bake in a heated 420 F oven for 30-35 minutes, reducing the temperature to 375 F as soon as the dish goes in. Comments: My husband commented that “this souffle should be a regular side dish in every classic American steak house.” How’s that for endorsement? It was unexpectedly excellent, considering that I improvised every step of the way through it. Shiitake mushrooms have an assertive taste, and adding some cremini to the mix mellowed the flavor a bit. If you have individual souffle molds, simply pour half the batter in each, and bake for slightly less time – say, 25 to 30 minutes. It’s a perfect amount for two (hungry) people; a perfect way to close a wonderful year! This does sound like a great side dish–or even a main course! The shitakes sound great with the gruyere, and this reminds me it’s been too long since my last souffle. I came out very tasty.